AQUA Carpatica still natural mineral water and naturally sparkling mineral water received the Superior Taste Award 2018 with 3 golden stars, the highest distinction possible, from the International Taste & Quality Institute. 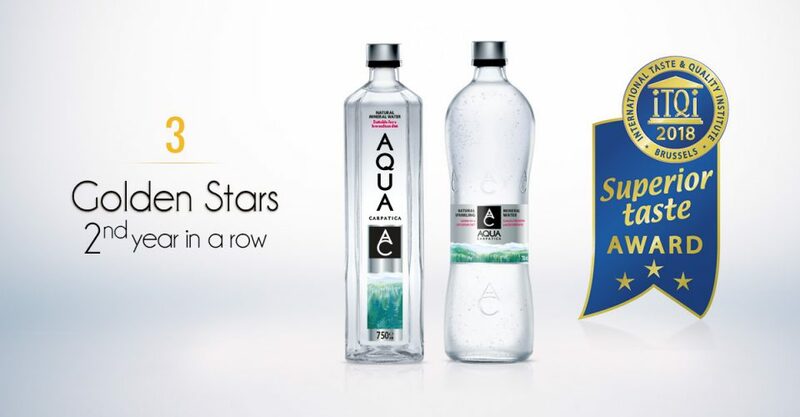 This is the second year in a row that AQUA Carpatica gets an overall score of over 90 % for both the still and sparkling natural mineral water. This Award gives a prestigious recognition to AQUA Carpatica as it was judged by a professional jury selected from the Association de la Sommellerie Internationale and other highly regarded drink experts. The taste experts have been selected based on their sensory analysis expertise and international experience and are unanimously recognized talents by guides such as Michelin and Gault Millau. iTQi is the world leading organization offering food and drink product evaluation by the professional taste experts. iTQi does not organize a competition, but rewards products based on their own merits following a tasting analysis. The Superior Taste Award concept is now used in 150 countries, and growing at a pace of 20% per year with the “iTQi Superior Taste Award” being a stamp of quality in taste. Taking into consideration that some jury members may have different opinions and in order to ensure objectivity of evaluation, the tests are conducted using a blind tasting methodology. Thus, the tasters are carefully kept unaware of the brand name of the producer and of the origin of the product. They only receive a short description of the product category. All products are presented in a standardized transparent and white china. Each expert evaluates and scores the product on his/ her own without communicating with other panel members. The evaluation process is done in accordance with the 5 criteria of the International Hedonic Sensory Analysis Method: First Impression, vision, Olfaction, Taste and Final Sensation. Each product is evaluated on its own merits. It is not a competition and iTQi taste experts evaluate each product compared to their expectations for the relevant category. The First Impression criteria weights an overall 50% of the total mark. AQUA Carpatica naturally sparkling mineral water gathered impressions from the jury such as: “Unique taste with a good intensity and acidity, powerful CO2.” ;“Very visually appealing- clear and bright, with small bubbles and a beautiful shine”; “Clean nose with nice mineral notes.”.